หลังจากกลับมาที่มักกะฮ์ มัยซารอฮ์บอกว่ามุฮัมหมัดทำรายได้เป็นสองเท่าของที่ลงทุน พร้อมกับบอกว่าระหว่างที่เดินทางกลับ มุฮัมหมัดได้หยุดพักที่ต้นไม้และนั่งพักตรงนั้น บาทหลวงเนสโทราได้บอกกับมัยซารอฮ์ว่า "ไม่มีใครที่จะนั่งใต้ต้นไม้นอกจากท่านศาสดา"
ยูซุฟ อิบน์ อับดุลบัรร์ นักวิชาการของนิกายซุนนีได้กล่าวว่า "เขามีลูกกับเคาะดีญะฮ์โดยมีลูกสาวแค่ 4 คน..."
"โอ้นะบีเอ๋ย ! จงกล่าวแก่บรรดาภริยาของเจ้า และบุตรสาวของเจ้า และบรรดาหญิงของบรรดาผู้ศรัทธา") ..."
↑ Sayyid Ali Ashgar Razwy. "The Birth of Muhammad and the Early Years of his Life". สืบค้นเมื่อ 7 November 2017. ↑ al-Tabari (1990). Volume 9: The Last Years of the Prophet. State University of New York Press. ↑ 4.0 4.1 "Islams Women". 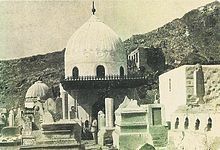 ↑ "Khadija bint Khuwaylid at the Tree of Faith". Archived from the original on 2012-04-07. ↑ Muhammad ibn Saad, Tabaqat vol. 8. Translated by Bewley, A. (1995). The Women of Madina, p. 10. London: Ta-Ha Publishers. ↑ Muhammad ibn Saad, Tabaqat vol. 1. Translated by Haq, S. M. Ibn Sa'ad's Kitab al-Tabaqat al-Kabir, p. 145–146. Delhi: Kitab Bhavan. ↑ 9.0 9.1 Guillaume (1955). The Life of Muhammad. Oxford. ↑ Lings (1983). Muhammad: His Life Based on the Earliest Sources. New York: Inner Traditions Internationalist. p. 83. ↑ Lings (1983). Muhammad: His Life Based on the Earliest Sources. Inner Traditions Internationalist. ↑ Guillaume. The Life of Muhammad. Oxford. p. 111. ↑ "Khadijah, Daughter of Khuwaylid, Wife of Prophet Muhammad". Al-Islam.org. ↑ Tabari, Tarikh al-Rusul wa'l-Muluk. Translated by Landau-Tasseron, E. (1998). Vol. 39, Biographies of the Prophet's Companions and Their Successors, p. 161. New York: SUNY Press. ↑ Guillaume. The Life of Muhammad. Oxford. p. 191. ↑ "Chapter 12: The Death". Al-Islam.org. ↑ Muhammad, Farkhanda Noor.Islamiat for Students. Revised Edition 2000: pp. 74–75. ↑ Qasimi, Ja'Far (1987). The Life, Traditions, and Sayings of the Prophet. New York: Crossroad. pp. 77–78. ↑ Guillaume. The Life of Muhammad. Oxford. p. 792. ↑ Muhammad ibn Saad, Tabaqat vol. 8. Translated by Bewley, A. (1995). The Women of Madina p. 9. London: Ta-Ha Publishers. ↑ Tabari, Tarikh al-Rusul wa'l-Muluk. Translated by Landau-Tasseron, E. (1998). Biographies of the Prophet's Companions and Their Successors vol. 39 p. 80. New York: SUNY Press. ↑ Shariati, Ali (1981). Ali Shariati's Fatima Is Fatima. Tehran, Iran: Shariati Foundation. ↑ Robinson, C. F. (2012). Encyclopedia of Islam, Second Edition. ISBN 9789004161214. สืบค้นเมื่อ 25 April 2017. ↑ Ishaq, Ibn. The Life of Muhammad (Reprint ed.). Karachi ; New York:: Oxford University Press. ISBN 0196360331. หน้านี้แก้ไขล่าสุดเมื่อวันที่ 20 มีนาคม 2562 เวลา 21:09 น.